But yes there are shades of gray, almost an infinite number of shades for that matter and for those of us who are inclined to see the world greater degrees of shades of gray, we probably have more choices. but, I think, a more complicated psyche. So if you own a bowling enter or an FEC, you have the choice to see things as black and white or in various shades of gray. For example, if you run a promotion, let’s call it “bowl your brains out” – you know x hours of bowling for $y dollars at a specific time – you have choices to add more or less hours, raise or lower prices, add more options like food and beverage and various prizes and surprises when people bowl and even add music or keep it quiet. Lots of choices, if you see it that way. Much, much fewer choices if you see it as just bowling, rental shoes, time and price. The real question is how does your potential customer and existing customer want to see it and are you offering that. Oh, you don’t know? That’s cool. here;s what you do: ASK THEM. Sometimes we even do the black and white thing with employees. We see them as good or bad, positive or negative, friendly or unfriendly or energetic or lazy. Unfortunately, when we do this, we have unfairly judged someone; simply because no one is just one thing. Maybe if you reinforced the positive while explaining how the negative hurts them from being happier, you could break through their narrow band of gray. But, candidly, I doubt it. They’re the ones you need to beware of; those folks who use words like “all”, never” “always” “none”, “everyone” and similar absolutes. They are the black and white types; they are the ones with the least amount of flexibility. So please watch for these words when you hire people, promoting people, giving them assignments and when you are making decisions that involve their participation. 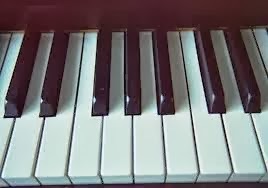 Because to play the music, you need the black and white piano keys, but there are many shades of sound within that black and white band…to make REALLY beautiful music.